Whether you are a business or an individual running a site, having a contact form is a must. It helps you to engage with your visitors better. A WordPress contact form will allow users to communicate with you in a quick, simple way. Your website is online for 24/7 and your customers come from all over the world. Don’t let them wait to get in touch on your working hours. They can send you a message anytime and wait for you to respond. You can gather valuable information about your customers. Visitors can fill out feedback forms about your site, that you can analyze and improve your content. A contact form is effective to reduce spam flooding your inbox. No need to share your email address for your customers to reach you. There are also certain tools to prevent spam bots from flooding your inbox. 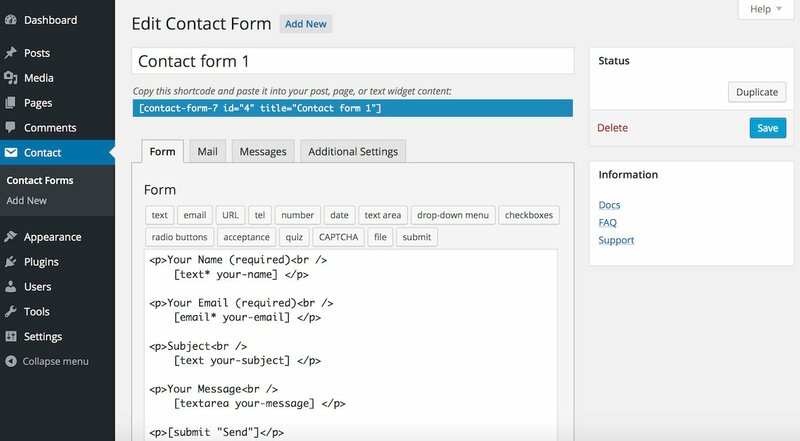 Adding a WordPress contact form to your site couldn’t be easier. You can use the form that comes with your theme, you can code one yourself or you can use one of the many great contact form plugins. With the variety of existing plugins, it can be a bit overwhelming when choosing one. So, we have collected the best WordPress contact form plugins for you. 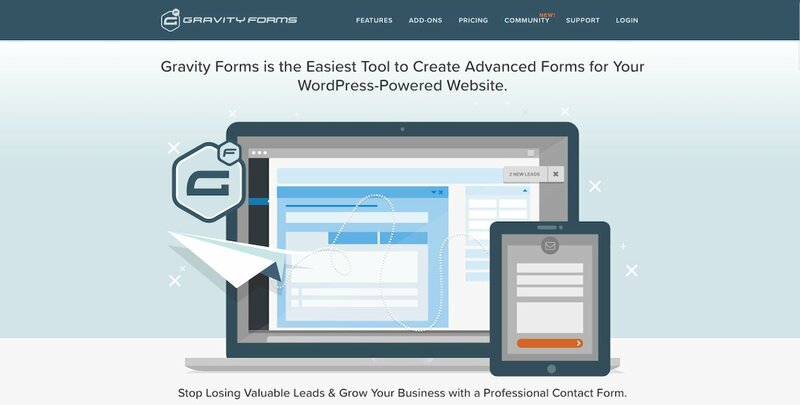 WPForms is perfect for beginners who are looking for easy drag-and-drop solutions. Bloggers or even business owners can use this WordPress contact form plugin to create a custom contact form for their WordPress sites. When a user submits a form, it will send you an email notification. This is important to ensure a fast response from your side. WPForms provides you with file upload features because one single image sometimes provides more information than countless lines of text. All you need is to add the upload fields in the form so your customers can upload images, PDFs, etc. WPForms provide pre-built templates. Simply add or rearrange the templates based on your needs. It could be a quote form, a donation form, or a subscription form. 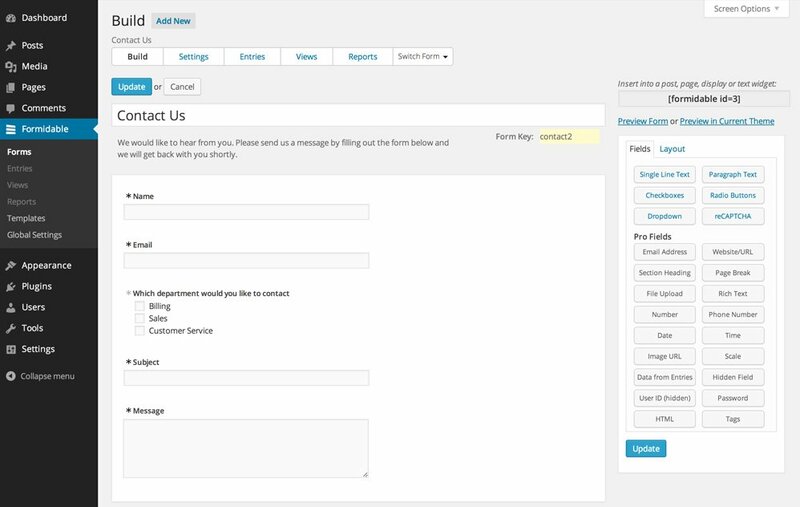 You can get WPForms’ lite version that includes email subscription and multi-page contact forms, payment integration, templates, and more. However, if you are willing to invest, the premium version offers you great support. You can get the basic plan for 39.50 for a year (discounted from its original price $79) or the Elite plan, which costs $ 299.50/year. The Elite plan is great for developers and agencies who want such features as unlimited sites, premium support, and client management. 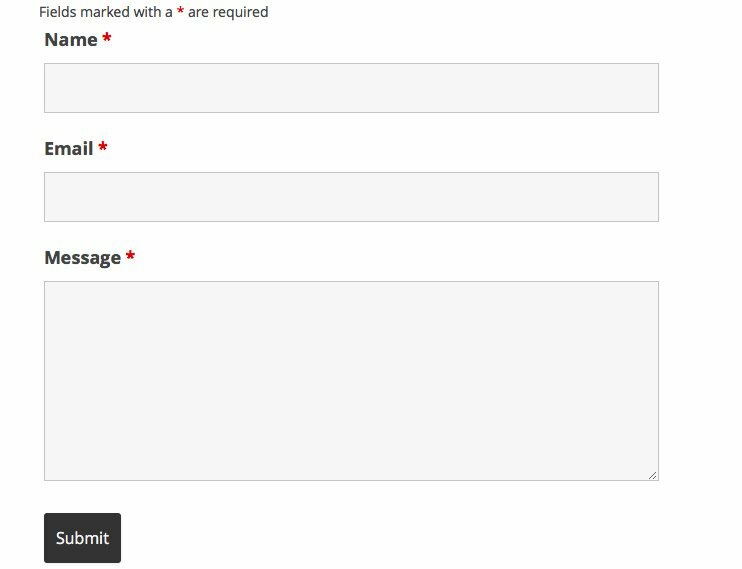 This WordPress contact form plugin lets you make nice-looking forms to get valuable information from your customers. FormMaker by WD is perfect for business owners and developers alike. With this plugin, you can create any kind of forms such as a registration survey, a questionnaire with conditional fields, multiple choice questions, etc. You can optimize the FormMaker by WD plugin’s drag-and-drop nature as you like. The Save progress feature allows your customers to save partially completed forms. The Conditional emails feature lets you send custom email notifications to different recipients depending on the form submitted. The Google Drive integration feature lets you store data to a Google cloud storage. The FormMaker by WD WordPress contact form plugin has more than 2 million downloads and a 4.5-star rating. You can download it for free and enjoy its pre-built templates and limited features. Or, you can get the premium version for $30+ and get a 6 months access to updates and support. They also have special offers that cost $99/year, with 12 addons and 50 premium plugins. 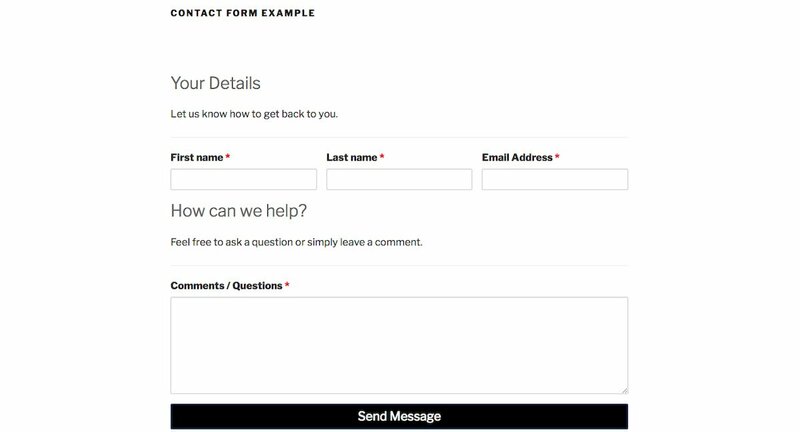 Creating a contact form with this plugin is the fastest solution. Right after you activate it, you will have a pre-made form to place on your site. 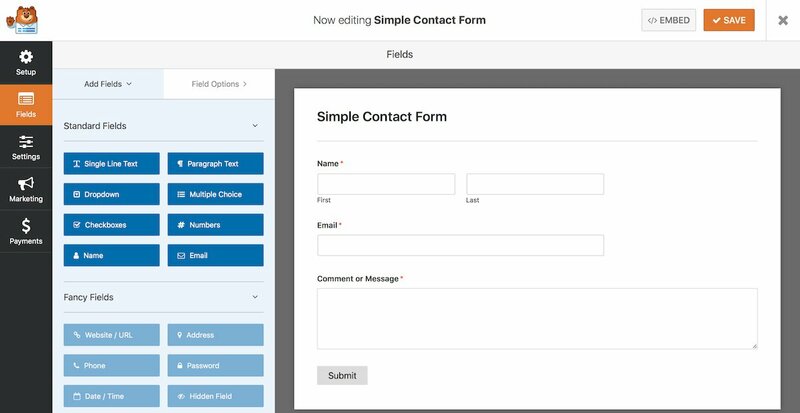 With this plugin, you can make a custom form with a predetermined set of fields. Additionally, it comes with a captcha feature to reduce spam and supports AJAX for faster interactions. Unfortunately, this plugin isn’t very beginner friendly as it doesn’t have a form builder. It means that to insert the contact form, you have to paste the shortcode into your WordPress editor. Caldera Forms is easy to use and has a lot of functionality. It has a great visual editor, so you can make sure that only necessary information displayed. This plugin is completely free to install. However, its premium version offers great support, enhanced email delivery options and offers loads of other functionality. If you prefer to use a monthly plan, you can start with the Basic for $14,99/mo. You’ll get unlimited forms, submissions, and antispam features. You can have add-ons such as the Entry Limiter, Mail Templates, Easy Queries, and more. Beginners can try its free version first before moving to Starter plan for more benefits. Formidable Forms lets you go beyond the basic functions of other similar plugins. The free version is 100% mobile responsive and has a great drag-and-drop form builder, which is great for beginners. It also has a free option to dynamically add form fields, in order to reduce visual clutter. The Premium version is $49/year and the Elite plan costs $399/year. Both of the price plans offer loads of functionality, customer support, etc. A feature that ensures that your customers enter their information twice. This will prevent typos and mistakes that can cause a lot of trouble for your visitors. Ninja Forms is free, however, the free version has limited features. If you want more benefits, you can get its premium version which is $499/year. The premium version offers customer support, constant updates for unlimited sites and has loads of great add-ons. The starter plan costs $29/year and offers customer support, but you will have to buy add-ons separately. Ninja Forms is a great option for amateurs, as it has an easy to use drag-and-drop builder. 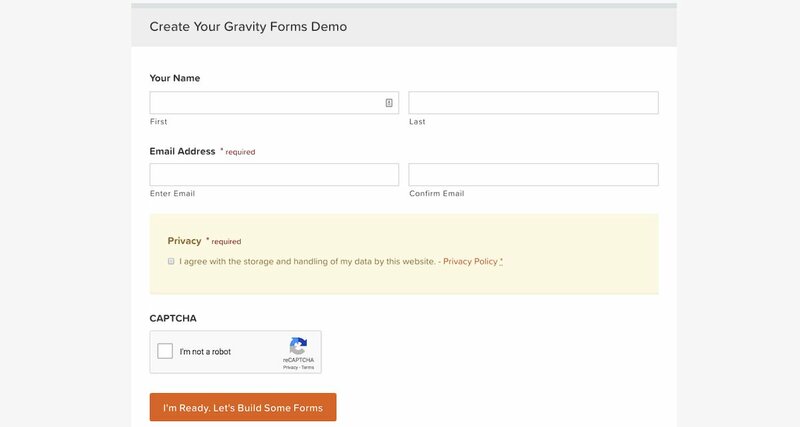 Gravity Forms is simply one of the best WordPress contact form plugins. However, unlike others, it has no free version. But if you can invest in it, you won’t be disappointed. The price starts with $59/year for the Basic License, $159/year for the Pro License, and $259/year the Elite License. With the plugin, you will get to enjoy unlimited forms and entries, conditional logic, file uploads, and more features. Depending on the plan you choose, you’ll get great add-ons like MailChimp and Slack. 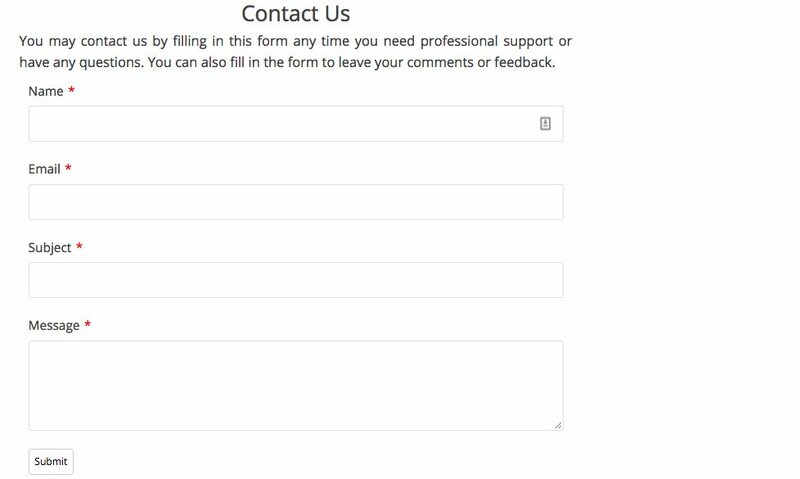 A contact form is an absolute must for your website. It makes reaching you super easy for your visitors. WordPress has a lot of amazing plugins, that make creating a contact form easy.